Welcome to my new blog. I have migrated from blogspot to the new wordpress blog. I am so excited with the move. My blog is still subjected to change in appearance as I am working on it. So bear with me. Today I am excited to be featured on Tag You’re It Challenge Blog for challenge #68. Thank You Tracey McNeely for the opportunity. I am particularly feeling special as I was a designer on the blog once and also a featured artist previously. So, very happy to be back featured on Tag You’re It blog. I am a dog lover. So this tag is inspired by dog. I love him to pieces inspite of his naughty behaviour at times. Although this dog image is not a cocker spaniel which is Charlie my dog, I love all dogs. 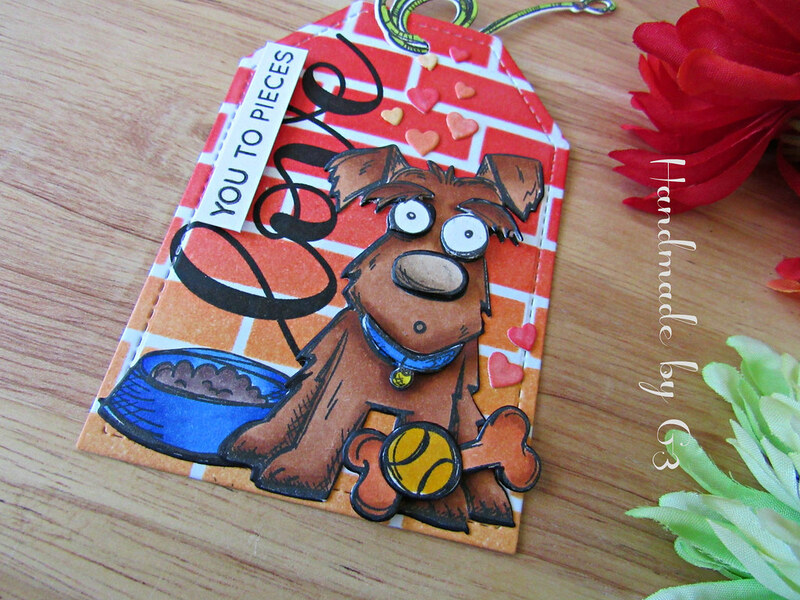 So Tim Holtz’s Crazy Dogs stamp set and dies are a must have in my collections. 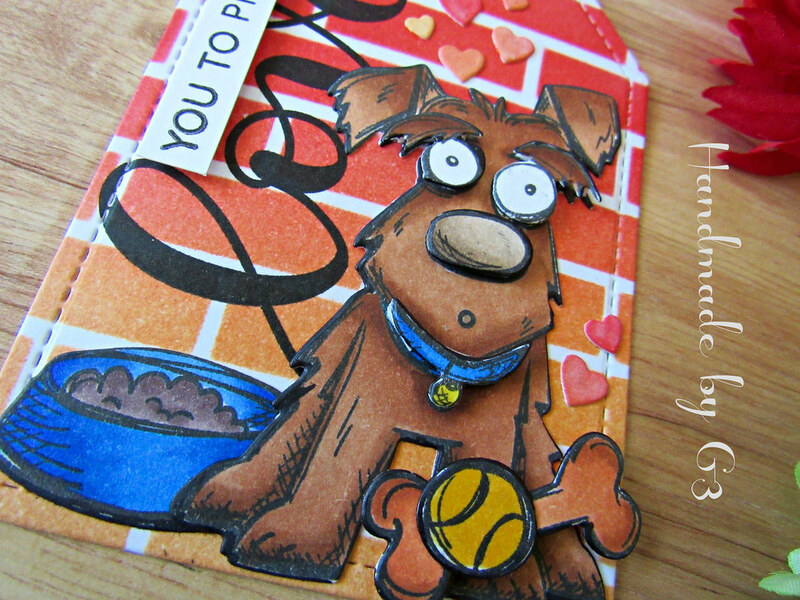 I started with stamping the image of this dog twice along with the ball, bone, leash and food bowl. I coloured them all with copic markers. Then die cut the images using coordinating dies. The tag is from Pretty Pink Posh. I sponged the background with distress inks Ripe Persimmon and Dried Marigold on brick stencil. I love the bright colours. The sentiment is from Kristina’s Love stamp set from Simon Says Stamp. I stamped the “LOVE” sentiment directly on the tag vertically using mini MISTI and Versafine Onyx Black ink. MISTI gave me a gove even coverage by stamping twice and thrice to get even coverage. 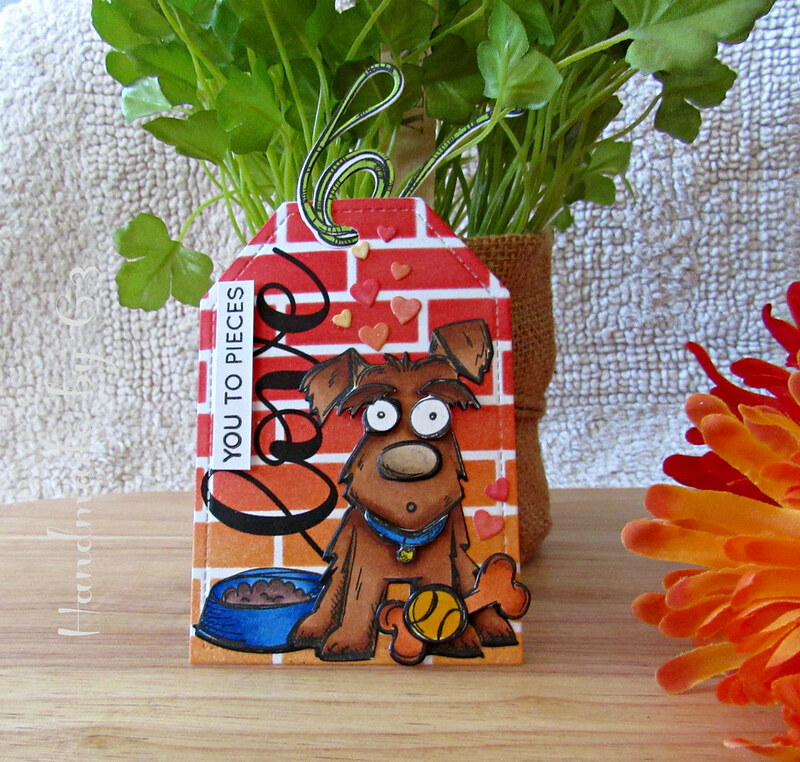 I adhered the die cut images on the tag including the detailed images of the dog like the eyes, nose and collar. Some of them were glued flush and some with foam adhesive for added dimension. You can see the dimension on the closeup photos below. The secondary sentiment is stamped on a strip of white cardstock and adhered on top of the main sentiment using foam adhesives. I used the leash as the tag ribbon. And a few heart shapes punched out of sponged cardstock using the same distress inks. Hope you are inspired by my tag. I cannot wait to see your take on my tag. Thank you so much for the opportunity Tracey. Thank you all so much for stopping by today. Wow…. 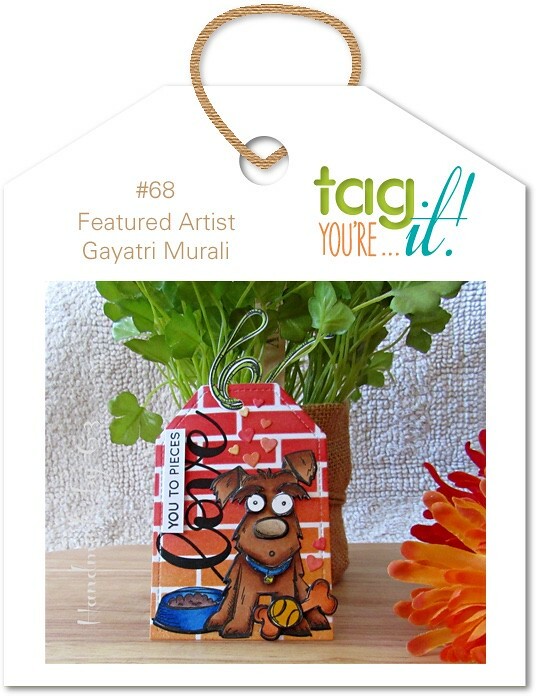 the up close detail on your tag is amazing, Gayatri! So happy you joined and inspired us this week! I could not find my brick background anywhere so I went with most of the colors, animals and sentiment stamped sideways, I love doing that! Very happy for you ! Great tag just love it the brick wall just ,makes it pop ! Good luck. 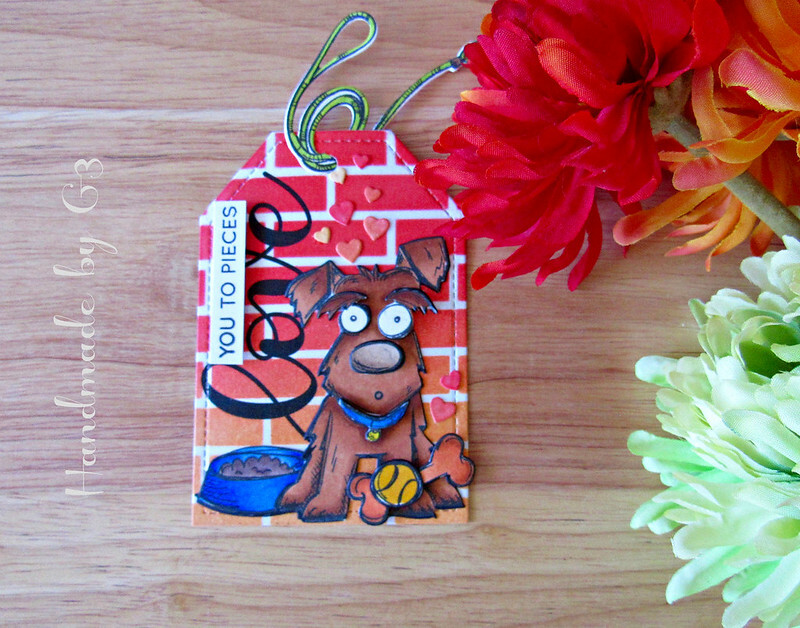 Oh my…I just love this little tag you created…thanks for the great inspiration and for being our guest at Tag You’re It! All the details are amazing, love it! Fantastic tag.. bright, colourful and cheerful…love it…love your new website too…look fabulous..!! WOW! Awesome tag. Love the background. Thank You so much Natalie. Hi Gayatri! Admired your work from afar for so long, so happy to see you as the guest artist at TYI! Love every amazing detail. Your coloring is just beautiful and detailed. Thank you for the inspiration! Thank you so much for your kind words on my work, Nancy! Love your tag Gayatri! The colours/colouring and image are fabulous; a mini masterpiece!